Ronaldinho was a Brazilian footballer who will go down in the history of the Club for bringing back the glory days. The passage of time has done nothing to dilute the joy that he brought to the thousands of supporters who worshipped his every touch at the Camp Nou, a journey that began 15 years ago today, when he was officially presented as a blaugrana. On July 21, 2003, 25,000 fans turned up at the Stadium just to witness his first few touches as a Barça player. Though he’d yet to play a match, the prospect of what he could bring to the Club meant excitement had quickly reached fever pitch with expectation levels also through the roof. 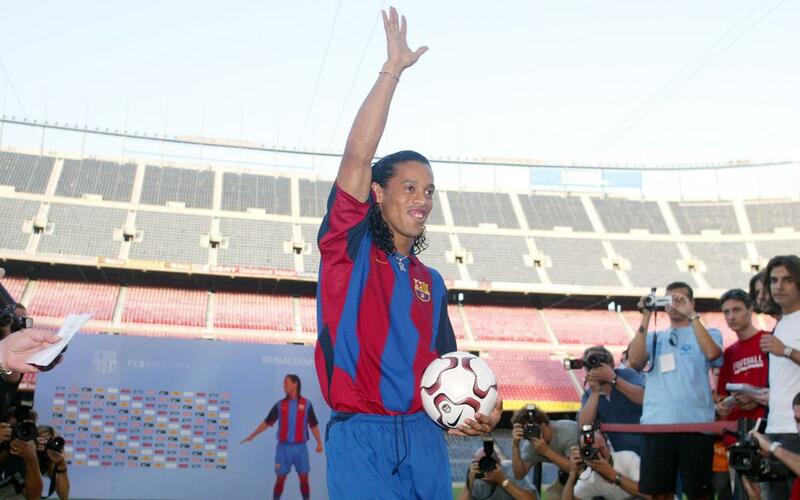 During his opening press conference, Ronaldinho expressed a desire to "give joy to Barça" and to follow the steps of his compatriots Rivaldo, Ronaldo and Romario. "I want to enter the history of this club,” he added. He certainly did that in the five seasons that he played at the Camp Nou, and some of his 94 goals were simply unforgettable. His debut golazo against Sevilla, a stunning overhead kick vs Villarreal, a double at Real Madrid and a mesmerising shot against Chelsea at Stamford Bridge are just a few highlights. Two Leagues and one Champions League were amongst a handful of trophies earned during his stint, whilst on an individual level he was named the FIFA World Player (2004 and 2005) and the Ballon d’Or (2005). He remains a totally unique football player, and one who changed the modern face of Barça.